2. 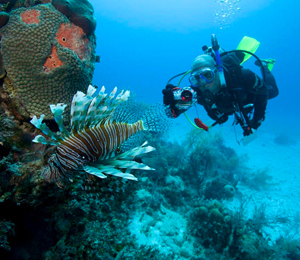 What Is A Scuba Diving Certification? 3. Do I Have To Be A Great Swimmer To Be Certified? No. All you need to be is a reasonably proficient swimmer who is comfortable and relaxed in the water. The swimming requirement for certification is an easy 183 meter/200 yard nonstop swim (with no time or specific stroke requirement) and 10 minute tread/float. 4. What is in a scuba tank? Oxygen? 5. How long does a tank of air last? This is a common question that, unfortunately, doesn't have a single answer. People breathe at different rates, and you breathe faster when you're swimming than when you're resting. Also, the deeper you go, the more you use your air, and, you can get different size tanks. So, the answer is "it depends;" this is why divers have a gauge that tell them how much air they have at all times. As an approximation, a diver sightseeing in calm, warm water at 20 to 30 feet deep can expect the average tank to last about an hour. 6. My ears hurt when I dive to the bottom of a pool. Won't they hurt when I scuba dive? 7. I Lost My Certification Card How Can I Replace It? If you forgot your C-Card while on vacation, PADI has a member check on-line or by calling 1-800 -729-7234, 1-800-SAY-PADI.